The Brandling Villa - F&B's Feast Of The East! A Soviet Scran Takeover! F&B's Feast Of The East! A Soviet Scran Takeover! For one week only, The Brandling Villa will be going nuts for Eastern Europe! Pierogi, sauerkraut, borek...our take on foods from St. Petersburg to Tbilisi..., including cheese/bread dishes from Georgia, Dumplings from Poland, meat filled pastries from Bosnia & milk & caramel cakes from Albania. Pierogi, also known as varenyky, are filled dumplings of Central and Eastern European origin. They are made by wrapping pockets of unleavened dough around a savory or sweet filling and cooking them in boiling water. These dumplings are popular in Slavic (Polish, Slovak, Ukrainian, Russian, Belarusian), Baltic (Latvian, Lithuanian) and other Eastern European cuisines (such as Romanian), where they are known under local names. Pierogi are especially associated with Ukraine, Poland, and Slovakia, where they are considered national dishes. Pierogi are often semicircular, but triangular and rectangular ones are also found. Typical fillings include potato, sauerkraut, ground meat, cheese, and fruits. The dumplings may be served with a topping, such as melted butter, sour cream, or fried onion, or combinations of those ingredients. Börek is a family of baked filled pastries made of a thin flaky dough known as phyllo(or yufka), of Anatolian origins and also found in the cuisines of the Balkans, Levant, Mediterranean, and other countries in Eastern Europe and Western Asia. A börek may be prepared in a large pan and cut into portions after baking, or as individual pastries. The top of the börek is often sprinkled with sesame seeds. Khachapuri is a traditional Georgian dish of cheese-filled bread. The bread is leavened and allowed to rise, and is shaped in various ways, usually with cheese in the middle and a crust which is ripped off and used to dip in the cheese. The filling contains cheese (fresh or aged, most commonly sulguni), eggs and other ingredients. It is Georgia's national dish. Borscht is a soup popular in several Eastern European cuisines, including Ukrainian, Russian, Polish, Belarusian, Lithuanian, Romanian, and Ashkenazi Jewish cuisines. The variety most commonly associated with the name in English is of Ukrainian origin and includes beetroots as one of the main ingredients, which gives the dish a distinctive red color. It shares the name, however, with a wide selection of sour-tasting soups without beetroots, such as sorrel-based green borscht, rye-based white borscht and cabbage borscht. Beers will be available from Baltika (Russia), Viru (Estonia), Budvar (Czech Rep), Zywiec (Poland) amongst others, plus a bolstered range of spirits and wines including plum brandy from Serbia, plus Croatian & Macedonian white wines. There will also be a bounty of cured meats and bar snacks! The Feast of The East will run alongside our regular menu from 12pm Monday 20th November to Sunday 26th November 2017. DIshes start from £3.50, beers from £3.95. 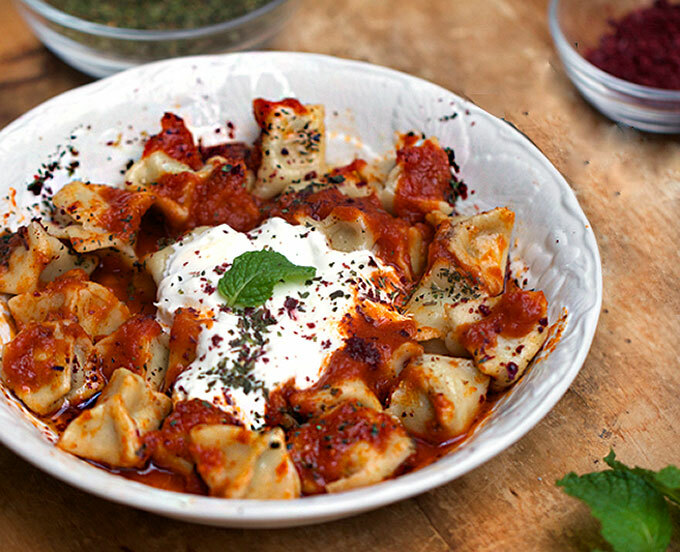 Traditional polish boiled dumplings filled with wilted spinach and sundried tomato. Discovered in a restaurant in Gdansk called Pierogarnia Mandu. Served with sour cream mixed with fronds of dill. Available pan fried on request. The deep fried, Japanese version of the Chinese Jiaoza, these bad boys are filled with sweet scallop & crispy corn, balancing against the saltiness of the soy & sesame. Comes with spicy sriracha dipper. This recipe originates in the Tibetan refugee settlements of Delhi, where they had their own complete community with their own newspaper, restaurants, drinks and food. These are filled with minced pork, ginger & chillies, and served with a hot sriracha dipper. A well loved Istanbul dumpling, filled with lamb, onion & parsley, boiled & baked before being served with brown butter sauce, a fresh, garlicky yoghurt & a caramelized, thick, tomato paste. Sprinkled with sumac & sesame seeds. The oldest style of dumpling, made especially for us by those geniuses at Nan Bei Chinese Dumplings in Grainger Market. These are the house favourite, with a secret pork and cabbage mix. Served with chilli flakes, sesame oil & dark soy. Find out more about Nan Bei here. Follow Nan Bei on twitter @NanBeiNewcastle. A Ukrainian dumpling, very similar to the Polish ‘pierogi’ or the Russian ‘pelmeni’. These ones are filled with a sweetened white cheese and deep fried before being drizzled with cranberry sauce & sour cream.